Our body has countless nerves, which are responsible for sending messages to our brain. When one of these nerves sustains damage, it is no longer able to effectively carry these messages, which means its function is damaged. This is known as neuropathy. Neuropathy comes in many different types. One is known as peripheral neuropathy, which means it affects the extremities of the body, which are the hands and feet. Nerve pain in feet is usually a progressive disease, which means it gets worse over time. Most people suffer from regular flareups, meaning they can be without symptoms for a period of time, before the condition comes back, usually worse than before. Within the peripheral nervous system, we find sensory nerves and motor nerves. The latter are responsible for movement, whereas the former are responsible for feeling. Neuropathy in the feet can affect either or both of these nerves. In the vast majority of cases, this is a result of diabetes, although other causes can be at play as well. Symptoms can be individualized, and it is rare for people to experience all of the exact same symptoms. It all depends on the cause of the neuropathy, which nerve has been damage, and how serious the damage is. In sensory nerve damage, most people experience burning sensations, tingling, numbness, feeling like bare skin is covered, pain, and sensitive skin. These symptoms are usually at their worst at night. If the damage is to the motor nerves, symptoms include paralysis, weakness in the affected muscle, loss of sensation, intestinal problems, dizziness when standing up, and drop in blood pressure. The last three symptoms are generally found only in diabetics. While neuropathy is not uncommon, it is actually quite rare for it to affect the feet. 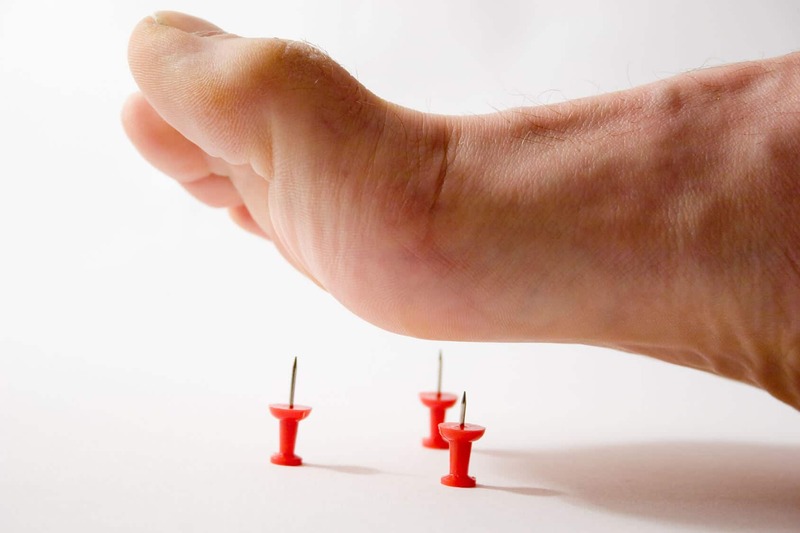 More commonly, someone will suffer from diabetic sensory neuropathy, which affects a range of nerves all over the body, although mainly the lower extremities (feet and legs). This affects sensory nerves, meaning there is no movement impairment, and this happens when people struggle to control their diabetes for many years. It usually comes with stinging, burning pain in both feet. 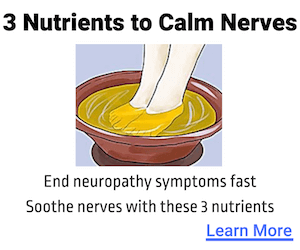 Alternatively, people may suffer from Morton's neuroma, or inter-digital neuropathy. This affects the nerves in between the toes, at the ball of the foot. It is also a sensory neuropathy, meaning movement is not affected. Usually, people experience pain between their fourth and third toe when they put their weight on them. Tarsal Tunnel Syndrome may also cause the neuropathy, specifically in the sole of the foot and the inside of the ankle. Again, this is a sensory form of neuropathy. The pain is at its worst during walking, when people experience shooting sensations, sometimes radiating all the way up their leg. Other forms of neuropathy that affect the feet also exist. What this demonstrates is that treatment should not be offered as a one size fits all solution, as each type of neuropathy has different causes. Neuropathy is always a symptom of a different condition, and this is what will need to be treated. Neuropathy cannot always be cured, and it is usually a progressive condition, meaning that it gets worse over time. However, it is generally possible to reduce the symptoms significantly, thereby improving the patient's overall quality of life. Many people experience neuropathy as a side effect of medications for other conditions. A physician will then need to determine whether the dosage or medication has to be changed, or whether the benefits of the medication outweigh the side effects. Often, medication leads to a vitamin deficiency, and supplementing with multivitamins, particularly with vitamin B complex, can often bring relief. For diabetic patients, it is very important that patients learn to control their condition. Diabetics who experience neuropathy symptoms must seek advice from a neurologist as it is not unheard of for diabetics to lose their feet. Additionally, following advice of a dietitian is vital. One new form of treatment is becoming increasingly popular. Nerve Renew is a natural supplement that contains clinically proven, highly powerful, B vitamins, antioxidants, Stabilized R Alpha Lipoic Acid, and herbal extracts. This supplement is an affordable, over-the-counter remedy that has provided significant improvements to people with neuropathy, so much so, in fact, that physicians have started to recommend it instead of, or on top of, prescription medication. Those who suffer from neuropathy should speak to their physician about the possibility of using this supplement rather than self-medicating, however.